Old Man Winter crouched, then rose gradually like a colossal beast, gazed southward and surveyed the landscape. It’s as if he mused to himself: “this is going to be a winter to remember – get ready for the onslaught.” And so ‘winter’s fury was unleashed with an unexpected vengeance – he was relentless. From his frozen nostrils he breathed arctic blasts of wintery weather which pervaded the land. He doled out menus of wintry mixes indiscriminately and superfluously. We retreated to cozy corners warmed by sparkling timbers from fireplaces kept alit. The aura and quietude invite thoughtfulness and reflection as I await the coming of spring. Climactic and social pressures swirl and forcibly thrust me into my virtual world to search for answers. Here I’m unrestricted; I can rely on my virtual tools and heightened readiness to investigate the why’s and wherefrom’s which accompany the ongoing community eruptions. History: the past, and the present — maybe it can provide answers for today’s festering issues. Here “freedom of expression” is the rule. An inquiring look at the past is not an indictment of authority or on shared responsibility. Mutual respect and equal justice for all is possible. As I drift off in my own realm of protected solitude and inquiry, I’m overwhelmed by an awareness of what once was. Colonial history’s influences emerge as phantoms before me: Sugar. Migration. Bias. No. No. No. Too farfetched! What do these dissimilar constructs have to do with what’s unfolding in our communities? Here’s where my virtual jaunt becomes more interesting. My sensitivities and sensibilities are quickened: clues from the past seem to prance before me and come into focus from everywhere. At first glance some of them seem unrelated and isolated, but then come into clearer focus. Is it possible to connect these present tragedies to past precedents? Am I on an imaginary wild-goose chase induced by a desire to understand the haunting complexities of contemporary life? Join me as I test my hypotheses and connect the historical dots. Sugar – That sweet something was introduced on the world market during the colonial period, whetted the appetites of Europeans, first caressing their tastes buds, then tickling their gastronomical tendencies everywhere from the Old World to the New World. People became addicted to this new commodity. Sweet tooth! Sweet teeth! The world was hooked. The universal crave was insatiable: More! Sugar required a massive workforce, and enslaved Africans replaced indentured servants and Native people. 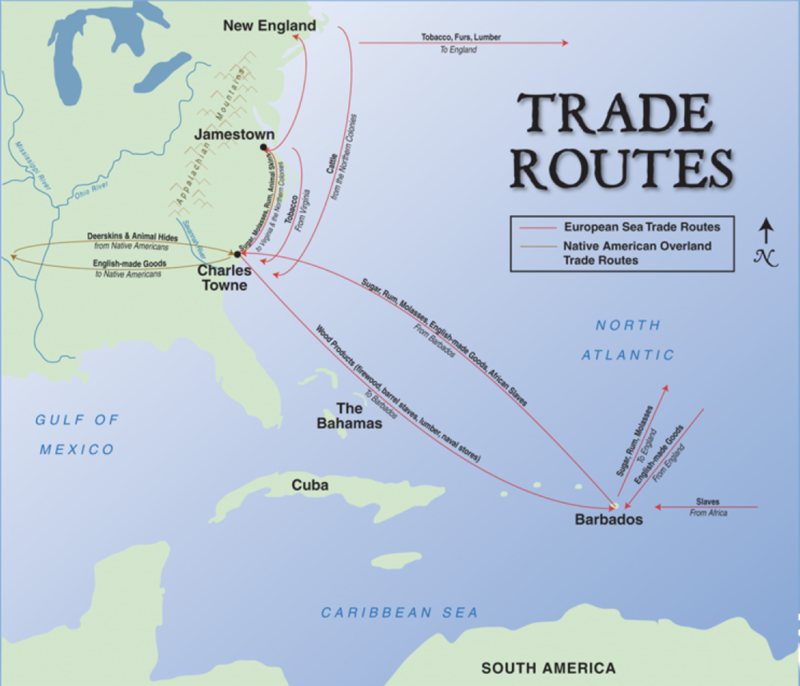 From Barbados, Briton’s take in what became known as the Americas grew, and the economy of the empire soared. The gross national output of the British colonies made England a wealthy nation marching steadily toward the industrial revolution. Could something so delectable and seemingly favorable be a contributing factor to a multitude of disturbances – tailwinds that changed the then-known world and still resonates into the present? Sugar cultivation and production set multiple trends into motion including mass immigration. Immigration – The call of the west beckoned many a young European adventurer to the New World. Ambition, a longing for freedom, and dissatisfaction with an antiquated feudal system drove them like spooked cattle to places they knew nothing of. Land and new frontiers awaited them. Adventure, hard work, new crops, and industry became compelling forces in their lives. Immigration began slowly and cautiously….then like a raging wild fire moving across dried and scorched plains. People began moving from place to place – from east to west – from Old World to New World. As winds of hope and a quest for freedom pushed European movement into the Americas, immigration became a byproduct with lasting and dire consequences which still resonate today. People left or were forced to leave their native lands for unfamiliar places – terrain upon which they had never trod. Seas, vast oceans, storms and hurricanes were no deterrent. The world’s population was shifting, and a collision of people and cultures ensued. Converging and competing practices abounded and dominated the landscape. For this new experiment of expansion to work, people had to coexist. A system of management and control was necessary, the planation system. Rules of engagement had to be set in place. That labor force was vital to the success of this new enterprise, and controlling it required force, contrivance and dexterity. The old practice of enslaving conquered foe had been reconstructed to fit the new demands of sugar production. The British in Barbados established “Slave Codes” which served their purposes and managed the enslaved. Their model of governance became known as the “Barbados Model.” Slavery was transformed and began to be solely identified with Africans and the African Slave Trade – terrible and lasting legacy. Persons of African descent were defined, subjugated and relegated to the lowest strata of society – our society. Bias – Escape from the realities of the present isn’t possible. An alarming and worrisome current descends and moves over the country like a pall. Communities remain on edge with a sense of foreboding that something unthinkable will happen. Not everyone is daunted, but then the unthinkable happens – another unarmed man of African ancestry is shot and killed by a police in North Charleston, South Carolina, one community removed. Perceptions in the community vary. For some emotions erupt and spew like hot volcanic lava that has spent centuries under pressure. Anger, distrust, fear and blame are the aftermath. Others see in those actions lawlessness, disrespect for authority, even provocation. I shudder in dismay – my heart-wrenching response: this is too close for comfort. Why! Why is this happening! Is this something new that’s descending upon us? What’s its origin? What’s driving it? When will it stop? Like those annoying gnats that accompany spring’s first dawning, words like “race” “racism” “racists” buzz around my head. No! No! I resist. This is 2015, in the Year of Our Lord. We’ve advanced as a nation – as a people! A war was fought and lives were lost to gain freedom. Later came marches and protests for civil rights. Many faced the wrath and resistance of authority to gain equal rights. Laws were enacted to protect people – all people. Government by the people – for the people became our mantra. These episodes are abhorrent in civil societies anywhere. Could it be that simple: bias? We’d like to move beyond the old terms that conjure up images of our colonial past where draconian laws were used to subjugate and control people who were deemed less than human – where lynching, branding, flogging were used by those in authority to instill fear and administer control. Does a less offensive term “bias” make the harsh realities that some in our communities encounter day after day more bearable? History and science now reveal “race” was a construct used for desired purposes. Does that negate the effects that still pervade our thinking and our attitudes today? I’m jolted back to reality. Utopia exists only in the imagination. Today spring is in full bloom. There’s beauty all around. Is the outdoors, the streets and neighborhoods traversed safe for everyone to enjoy? .Civil society requires responsibility and accountability from all sides. Are we there yet? We must know and understand our past – we must acknowledge where we are failing today. We must respect ourselves, each other and our communities.